RUSH: Here’s Louis in Humboldt County, California. Great to have you on the program. Hello. RUSH: You can talk. Yes. It’s Open Line Friday. That’s why you are here. CALLER: I’ve been sitting here so long. Yes, I want to try to be respectful to Mr. 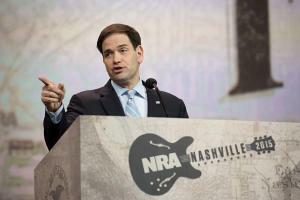 Senator Marco Rubio, and I’m a little confused as to why we conservatives like him and aren’t threatened by him. I hope that’s not too harsh. RUSH: Well, more importantly, rather than discussing everybody else, we need to discuss with you why you don’t particularly like him and why you’re not enamored or why you are threatened. Why are you? CALLER: I’m coming from a California perspective. Our state has suffered greatly with illegal aliens. We have had hospitals close for $16 billion in debt. It’s an endless pipeline of people coming into our state. They come into Arizona, then they come to our state, and I don’t think that many conservatives in the Republican Party realize what has happened to this state and realize that this will probably happen to the rest of the country. RUSH: I think you’re right about that. RUSH: I don’t think enough people are willing to look at it from that standpoint because politicians are looking at these people as voters, let’s be honest. RUSH: They’re looking at them as potential voters. And on the Democrat side they’re looking at ’em as potential benefit recipients. They’re looking at some of them as new additions to the underclass, which will need government, need the Democrat Party. As for Senator Rubio, he has been explicit that unless there is border security to stop this inflow that you’ve described, stop this massive immigration at the border, he’s not gonna support any of the rest of it. CALLER: Right. Okay. I guess we have to take him at his word. RUSH: We will. We’ll have to find out if he means that. RUSH: And time will tell. We will find out at some point whether he means it. RUSH: I take him at his word. RUSH: To be fair to you, your suspicions are valid, because the Democrats are already saying, “Well, we’re not gonna be concerned with border security,” or they’re saying there already is border security. They’re saying we don’t need to do that. But you, I think, are representative of a fact here, and that is that the voters, particularly in California, but the voters of this country are way ahead of the political class on this issue. You are much more informed and sensitive and attuned to the damage that this has caused. CALLER: Yeah. I watched it my whole life living in this state. I’ve seen the reality of what happened. RUSH: By the way, you’re in Humboldt county. RUSH: Has it reached that far north? CALLER: Well, you know, the funny thing is, ever since Obama did his little executive order, I’ve noticed more what look like illegal aliens here. I know some people say, “How do you tell?” and stuff like that. There are a lot of dairy farmers around here and I think they’re coming up to take the dairy farm work. CALLER: So it seems like it’s increased since he did his executive order. RUSH: — county. I assume it still is. CALLER: There’s pockets. There’s a lot of debate, you know, regarding the marijuana, you know, dispenser areas, and some cities are going, “This brings trouble, we don’t want this,” and another city will take it up. And I think there’s pockets of conservatism. RUSH: Well, obviously you’re in one of them. CALLER: Yeah. We’re an island of conservatism. RUSH: What do you do for a living in Humboldt County? CALLER: Actually right now I’m an aspiring filmmaker and I’m a caretaker. RUSH: You’re an aspiring filmmaker and a caretaker. RUSH: I got it. Okay. Well, California’s a perfect place for that. RUSH: I’m glad you called, Louis. Thanks much. COSTELLO: (shouting) Rush Limbaugh still looms large! The man TIME Magazine calls the GOP’s “savior,” Marco Rubio, meeting with the talk show host last week, went on his show to sell his new immigration plan! So the question: Can you reinvent yourself and still kowtow to Rush Limbaugh? RUSH: There’s the question for every Republican politician: Can you reinvent yourself and still kowtow to me? You see, what I’m inferring she means is that I’m a dinosaur. I’m a relic. Can you, if you’re a Republican, get hip — can you modernize, can you get with the times — and still satisfy me? Because you have to satisfy me if you’re gonna be anything in the Republican Party. That’s what Carol Costello thinks. CARDONA: Not if you want to reinvent yourself credibly. (giggles) They need to get rid of the idea that Rush Limbaugh is a real political leader. He’s an entertainer, and he has even said that himself (giggling) and as long as Republicans believe that he’s a real political leader, their makeover is going to be just very superficial and it’s not gonna work. RUSH: So if they continue to treat me as any kind of a guy with political leadership characteristics — if they look at me as any kind of a person that has large following, that I’m leading with ideas — that’s not gonna work. That’s Maria Cardona. She’s a Democrat strategerist. Remember, now, she’s just echoing what Obama said. (interruption) I don’t know from where. We’ve played sound bites of this woman before. She’s one of these television strategerists. Fox has ’em, MSNBC has ’em, CNN has ’em. They’re people that call themselves “strategists.” I don’t know for who she strategizes. When you watch these people on TV, when you see them, and the graphic underneath says “Democrat strategist,” my guess is you think that they have some official tie to the Democrat Party and that they are strategizing or helping to plan or whatever, and they have some official linkage to the party. Oftentimes, that’s not the case. They’re just people with opinions, and they’re on TV, and they’re telling people what the Democrats are thinking and doing and what the Democrats ought to think and what they ought to do. But I think there’s a bit of a misleading aspect of the presentation here. Republicans, too. Not just Democrats. They want all these people on TV. I can tell you that 90% of the Republican “strategists” on TV have nothing to do with the party. They’re just people that have opinions that go on television and voice them. But that graphic, “Republican strategist” or “Democrat strategist,” implies officialdom, and I don’t think they are. I would venture to say that I have more people in this audience following my strategery than Maria Cardona does wherever she strategizes or what have you. It’s just a wild guess. STEWART: Well, every candidate for the most part will go down to south Florida and kiss the Rush ring. That’s just what you do. RUSH: That’s the Republican strategist. Her name is Alice Stewart, and they’ll come down here and kiss the ring. Well, that’s what happens to popes. She’s not a candidate. I don’t know that she’s coming down to kiss the ring. This what happens to popes. You’ve seen it. TIME Magazine called me the pope. That’s why she’s saying this, come down and kiss the ring. I’ll tell you what happens. There are gonna be a lot of people who survive this weekend because of me who are gonna want to come kiss my ring who otherwise would die if they hadn’t been listening to me. These people are in for a shock, these strategists. I don’t know who Maria Cardona is. In saying that, I’m not trying to insult her. I don’t know who she is. You can keep asking me and I only know that we played sound bites from her a couple or three times saying other stuff as a strategist. I don’t know who she is. I don’t know where she lives. I don’t know if she’s threatened by the storm or not. I have no idea if she’s in danger. RUSH: Somebody sent me a little bio on Maria Cardona. Snerdley seems obsessed here with who she is. It turns out she has worked for the DNC. She works for some K Street lobbying firm now, I think, if I read this right. She does outreach. She’s a Democrat. She is a legit Democrat strategist. Not that that qualifies her to understand me. Most people in politics don’t understand, even after 25 years, they still don’t get what I am or what this show’s all about. It really is amazing, particularly on the Democrat side. Anyway, I had said most of these people really have no official tie, they’re just labeled. She does have official ties to the Democrat Party. So she is a legit strategerist. She advised Hillary, who hasn’t won anything. I’m just throwing that in. And we helped Hillary, don’t forget, Operation Chaos, and they still hate me. Okay, I keep forgetting. She won Senator New York. But no Republican was gonna win that. They really can’t count that as winning. She carpet bagged in there. Bill Clinton’s her husband. Yeah, the reason nobody thinks to add that to the win roster is, who was her opponent? Can you tell me who her opponent was? See, Rick Lazio. There was never a prayer once he crossed the aisle. Once he said he wanted her to sign the joint campaign spending pledge or whatever. But she did win that, I just keep forgetting. That was in the cards. That was like an anointment.